Fifty years ago, when I was a boy, it seemed completely self-evident that the bad old days were over, that torture and massacre, slavery, and the persecution of heretics, were things of the past. Among people who wore top hats, traveled in trains, and took a bath every morning such horrors were simply out of the question. After all, we were living in the twentieth century. On the 28th of April 1900, the Prince of Wales visited the Natural History Museum in London to unveil a statue of the legendary man of science, Thomas Henry Huxley. At the dedication of this monument to his grandfather, Julian Huxley stood beside his ostentatiously erudite father, the schoolmaster and author Leonard Huxley, then at work on the Life and Letters of T. H. Huxley. On his other side stood his beautiful and quick-witted mother, Julia Arnold Huxley, a scion of the Arnold family who was preparing to found a school of her own at Prior's Field in Surrey. It fell to Julian to manage his younger brothers, Trevenen and Aldous, while his mother was busy with his newborn sister, Margaret. Nonetheless, Julian was delighted at this chance to wear his new Eton uniform for all to see: black trousers, a slim black jacket, the distinctively sharp Eton collar, and a brand new top hat. Now thirteen and advancing steadily in his formal education, Julian could remember his first conversations about the life sciences with Thomas Henry Huxley, and he could even recall with some pride the time he had bested the world-famous biologist concerning the familial behavior of a fish known as the stickleback. He was now old enough to know that the family patriarch had made a name for himself by defending Darwin's theory of evolution against a horde of angry critics, including the bishop of Oxford, Samuel Wilberforce. Thomas Henry Huxley's supporters had hailed him as an indefatigable advocate of science and progress, while conservative critics on both sides of the Atlantic had accused him of inventing a new bottle, labeled "agnosticism," for what was nothing more than the dangerous old wine of atheism. So much had changed since that storied debate at Oxford in the summer of 1860. This monument and the presence of the future king Edward VII at its unveiling bore witness to the fact that, five years after his death, Professor Huxley's reputation and his cause were both thoroughly established. Darwin's theory of evolution was now widely accepted by educated people across the industrialized world. Even in China, where the Qing dynasty was caught in its own Darwinian struggle for survival, the court reformer Yen Fu had galvanized the attention of the literati by translating T. H. Huxley's Evolution and Ethics into classical Chinese. In addition to achieving global renown, T. H. Huxley had been the recipient of so many honors from the British establishment in the last decade of his life that he archly joked to his son Leonard that he expected to be appointed as a bishop someday. While he no doubt enjoyed such vindication and acclaim, T. H. Huxley remained deeply aware of the ethical problems posed by the Darwinian revolution. At the end of his life, he had come to see the human condition, in light of Darwin's discoveries, as a profound paradox: it was imperative for human beings to cherish and protect their sense of morality, even though there was no clear message to be derived from the science of evolutionary biology that might serve as touchstone for human ethics. The burden of his agnostic position was captured in the monument that the prince of Wales unveiled that April morning. The last public monument to be crafted by Royal Academy sculptor Edward Onslow Ford, the piece captures T. H. Huxley seated but certainly not at rest. His left hand is balled in a fist, reflecting the tension on his brow, while his right hand grips the arm of his chair as if he is just about to pull himself up and strike another verbal blow against any one of his myriad adversaries from a life that had been full of public battles. Julian's youngest brother, Aldous, stood nervously to see the proceedings, and to gaze at this imposing statue through the throng of adults. At six years old, Aldous was very thin and much taller than most children his age. His preternaturally large head seemed ill placed atop his spare frame, prompting his siblings and playmates to give him a nickname that he would remember for the rest of his life, "Ogie"-short for ogre. As he grew up, Aldous would have only the dimmest memories of T. H. Huxley, but, like his eldest brother, he would dream until his adolescence that he would one day also have a career in the sciences. Specifically, Aldous set his sights on the field of medicine, though these aspirations were cut short by an adolescent illness that would badly damage his eyesight. Although he would pursue a career in literature, he never forgot his grandfather's fierce devotion to uncovering the truth about the origins and nature of life, however shocking it might be to our sensibilities. When he was an old man, the main thing that Julian would remember most vividly about this event was not the fact that the prince of Wales and numerous members of Parliament were there, along with many of the late professor's former students, to honor the memory of his grandfather. He would not remember the statue, which was placed opposite a statue of Richard Owen, one of T. H. Huxley's rivals in more than a few scientific controversies. He did not recall the presiding official's remarks, in which he recounted that donations for the Huxley monument had come from every state in Europe and from the United States, India, and "the remotest colonies," nor did he recall the gratitude expressed that the prince of Wales had survived "the dreadful peril" of a recent assassination attempt by anarchists in Belgium. What Julian Huxley did recollect from that morning was the way in which his sick little brother Aldous nearly spoiled the whole affair for him. It is not difficult to imagine how such a lifelike figure of their late grandfather, so ready to spring up from his chair, may have been disturbing to a gangly boy of six that morning. And his nervousness would have no doubt been compounded by the crowds, the presence of royalty, and the echo of so many feet and so much whispering in the North Hall of the Natural History Museum. Or maybe young Aldous had picked up a virus on the train into London from Surrey. Whatever the case may have been, young Julian was implored "in urgent whispers" by his panicked mother "to give up his top hat . . . for Aldous, queasy, overcome, to be sick in." The ditty continues with an arch salute to "martyred brothers [sic] patient grief" and a brief catalog of Julian's "love affairs beyond belief" in which names are replaced with single initials. Given the date of the letter, May 28, 1908, "the beauteous K." with whom Aldous closes the list is most likely the same "K." to whom Julian was engaged at the time-until she broke off the engagement in the spring of 1913. For a budding satirist such as Aldous Huxley, the very serious-and frequently self-serious-Julian must have been the perfect straight man on which to practice his craft. The majority of Aldous's papers and letters were destroyed in the Hollywood Hills fire of 1961, including the letters he received from friends and family over the years. Thus there is no evidence remaining to tell us whether the ribbing that Aldous delivers in this letter from May 1908 flustered or upset Julian to any significant degree. In light of the events that would take place in the succeeding months and years-their mother's death from cancer in November 1908 and their brother Trev's suicide in August 1914-the letter takes on a poignancy that its author could barely have imagined as he crafted these rhymes to gently ridicule his eldest brother. In his memoirs, Julian Huxley describes the reactions of Trev, Aldous, Margaret, and himself to the untimely death of their beloved mother, Julia Arnold Huxley. In a particularly telling passage, Julian recounts how his horror at the sight of his sick mother prompted him to literally run away from her bed: "I was overcome, and ran out into the drive-anywhere in the open air, away from that doomed bed." Although he was a young man of twenty-one who had just won a prestigious literary prize at Oxford, the grief and horror of this scene left Julian utterly incoherent. Moments after he fled from his mother's deathbed, "Mrs. Judson, a Charterhouse master, came to ask how she was: I just couldn't answer and rushed out into the fields with my misery." At the funeral, Julian recalled that "Trev and I were on the verge of tears, and Aldous, then at the critical age of fourteen, stood in stony misery." The youngest Huxley, Margaret, "looked bewildered and frightened, as well she might, destined at an early age to a bereft existence, until my father married again four years later." The death of their mother meant the end of their bucolic life near the Charterhouse School, as their father moved them a few months later into "a gloomy London House in Westbourne Square, away from our beloved Surrey." We Are Amphibians tells the fascinating story of two brothers who changed the way we think about the future of our species. As a pioneering biologist and conservationist, Julian Huxley helped advance the “modern synthesis” in evolutionary biology and played a pivotal role in founding UNESCO and the World Wildlife Fund. His argument that we must accept responsibility for our future evolution as a species has attracted a growing number of scientists and intellectuals who embrace the concept of Transhumanism that he first outlined in the 1950s. Although Aldous Huxley is most widely known for his dystopian novel Brave New World, his writings on religion, ecology, and human consciousness were powerful catalysts for the environmental and human potential movements that grew rapidly in the second half of the twentieth century. While they often disagreed about the role of science and technology in human progress, Julian and Aldous Huxley both believed that the future of our species depends on a saner set of relations with each other and with our environment. Their common concern for ecology has given their ideas about the future of Homo sapiens an enduring resonance in the twenty-first century. 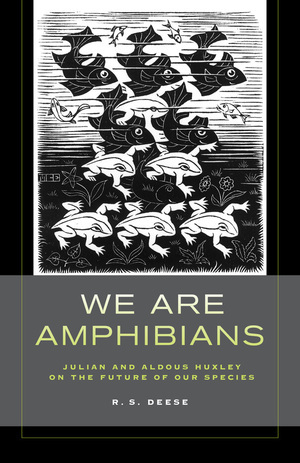 The amphibian metaphor that both brothers used to describe humanity highlights not only the complexity and mutability of our species but also our ecologically precarious situation.